MMA announcer Jeff Gorman is your tour guide for the history of UFC...one show at a time. Bruce Beck welcomes us on play-by-play and throws it to color commentator Jeff Blatnick for an interview with Don Frye, who won UFC 8. He relishes his role as the favorite in tonight’s tournament and calls his first-round foe, Mark Hall, a “dangerous’ opponent. Big John McCarthy keeps up his streak of refereeing every UFC event. Bruce Buffer makes his debut as the Octagon ring announcer, and he sounds great right off the bat. Frye is 4-0, winning the UFC 8 tournament and beating Amaury Bitetti at UFC 9. Beck is calling Hall “The Giant Killer” after his UFC 9 win over sumo wrestler Koji Kitao. Both men are UFC rookies as well as kickboxers. Fiedler is from Missouri, while Johnston hails from California. No kickboxing at all to start, as Johnston lands a pair of judo trips. Fielder gets Johnston’s back but can’t get the rear naked choke. Johnston gets Fiedler’s back and he can finish! After a flurry of punches, McCarthy stops the fight at 2:27. Coleman was an NCAA champion wrestler at The Ohio State University. Horenstein is the first Israeli-born UFC fighter and “survives” with a full-contact karate attack. He was influenced by Bruce Lee movies. Who wasn’t? Coleman takes Horenstein down and unleashes some of his legendary “ground and pound.” Horenstein survives for a while, but Coleman drops some more heavy bombs. Horenstein covers up, and McCarthy calls for the TKO at 2:43. Campetella is a biology teacher from New York City and weighs 235 pounds. He gives up six inches and 28 pounds to the Canadian Goodridge, the runner-up at UFC 8. Goodridge (2-2) is one of the first “mixed martial artists,” judging by his hybrid fighting style. Both men start whaling away at 100 mph to start, and Campetella lands some strong uppercuts. Goodridge pulls him down into his guard, flips over and drills him with three crushing lefts. McCarthy has seen enough, and it’s a TKO win for Goodridge at 1:27. Hold on: McCarthy explained during an interview later in the show that Campetella actually tapped out. The semifinal brackets look promising: Don Frye vs. Brian Johnston and Mark Coleman vs. Gary Goodridge. This is the part of the article where I beg for no injuries to screw up these fights! Tank Abbott talks about coming off a suspension and looking forward to getting back in the Octagon. He makes fun of Ken Shamrock and Dan Severn for their mutual non-aggression in the main event of UFC 9. Despite their different fighting disciplines, Johnston compares his fighting style to Frye’s, according to Beck. After an early stalemate, Johnston lands a pair of strong rights. Johnston isn’t backing down from a brawl with the undefeated Frye and he’s doing well. Frye gets a takedown at the three-minute mark and starts going to work on the ribs like he did against Hall. Frye gets side control and busts Johnston wide open with an elbow to the head. Johnston taps out at 4:38. Coleman controls the first two minutes on the ground with top position. Coleman passes guard and tries to suplex Goodridge, who blocks the attempt by hanging onto the cage. Coleman blasts Goodridge in the face several times. Big Daddy has had enough and starts stalking Coleman in the stand-up. Coleman lands a beautiful double-leg takedown and gets the rear naked choke for the tap-out at 7:00. Jeff Blatnick asks Dan “The Beast” Severn why his UFC 9 fight with Ken Shamrock was so “boring.” Severn chooses the word “strategic” instead. Battle of 6-foot-1 wrestlers in the main event, and they are both undefeated in the Octagon. Coleman holds a 31-pound weight advantage. Coleman gets the first takedown and maneuvers Frye into position for some of his signature ground-and-pound. Coleman isn’t letting Frye get away, as he keeps slipping strong punches past Frye’s defense. Coleman goes for a neck crank and it doesn’t work, and the bloodied Frye finally gets away after four minutes of getting pounded. Frye tries a double-leg, but as Blatnick points out, Coleman is just too big. Coleman can’t finish a rear naked choke. Coleman picks up Frye for a huge slam, but Frye saves his own life by grabbing the top of the cage. Headbutt by Coleman, and Frye is so bloody that McCarthy calls for the doctor…and then stops the fight at 11:36. 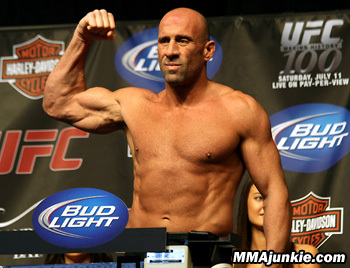 Mark Coleman wins UFC 10 – good night, folks!